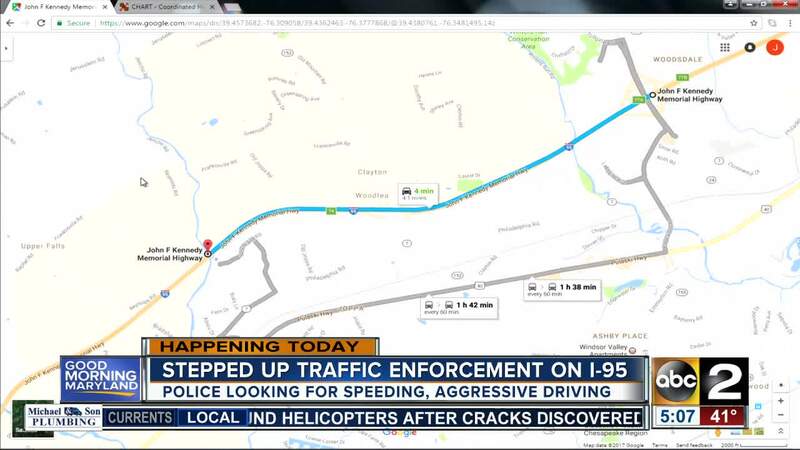 Part of an initiative to increase safety on I-95 begins Thursday with extra patrols around Harford County. The initiative is part of a five-year safety plan put together by Maryland's Motor Vehicle Administration. The goals are to promote safe driving practices, reduce crashes and enforce Maryland's move over law. A number of law enforcement agencies are working together - including Maryland State Police, the Harford County Sheriff's Office, officers with the Maryland Transportation Authority and several city police departments in Harford County. Police will focus on a 4-mile stretch of I-95 northbound and southbound between the Harford and Baltimore County line and the Route 24 interchange. The posted speed limit in that area is 65 miles per hour. Police will be looking for people tailgating, switching lanes aggressively, talking on cell phones and failing to obey the move over law. Each year, there are about 15,000 speed-related crashes in Maryland.